When giving gifts, it is nice to give something practical that will both bring comfort and make the life of the recipient a little easier. This simple “Soup in a Jar” is nutritious, delicious, inexpensive, and it doesn’t take long to make or cook. The “red” lentils in the recipe actually look orange, and the “green” are mostly brown…but that is what they are called. For the sun-dried tomatoes make certain you get the ones that are packaged dry, not packed in olive oil. Lentils are an excellent source of dietary fiber, B-1, and folate. Make certain jar is clean and completely dry. Pour in the onion, garlic, and bullion. Next pour in the red lentils and smooth to an even layer. Top with the green lentils and parsley; even the top. 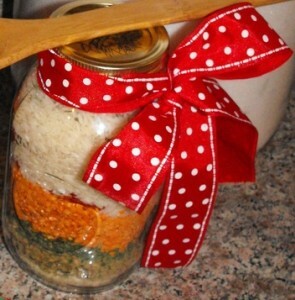 Stir together the rice, sun-dried tomatoes and seasoning blend—pour into jar and then seal. Lentils- a tasty legume that is perfect for soup. Sort and rinse lentils. Sauté onion, pepper and garlic in olive oil until onion is translucent. Add celery, carrots, lentils, 6 cups water, bay leaves, thyme, rosemary, and wine. Cover, bring to a boil, and then simmer about 45 minutes. Stir in spinach, parsley, lemon juice, and sugar. Stir in pasta and cook until pasta is done. Add salt and fresh ground pepper to taste. To serve, ladle into bowls and top with fresh grated parmesan cheese. Serve with bread.